Available exclusively through us at HA Motorsports is the Moates Demon ready P06/P75 OBD1 Non-VTEC ECU. Fits both Demon Verson 1 and 2. Fully prepped for plug and play installation of the Moates Demon module. This ECU is ideal for use with Crome Pro or Neptune engine management systems on Non-VTEC D,B,F, or H series engines. This P06 non-VTEC ECU has unique Moates Demon style datalogging header pins for proper fitment, as well as 'J12' removed for full duplex communication across the datalog port. Full 90 day warranty on all HA Motorsports ECU's. 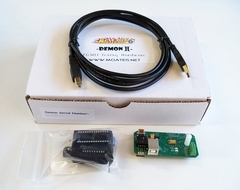 Moates Demon Version 2 Real Time Programming/datalogging System. Fits OBD1 USDM civic/integra style ECU's. Designed for use with the Neptune RTP system (Neptune RTP License required). The Moates Demon II is the newest creation for use with the Neptune RTP system and builds on the solid foundation of the original Demon with increased speed and performance for reliable operation. Installs in the place of your standard 28 pin chip and ties in with the CN2 datalogging port for simple installation.